All these qualities can be enjoyed in any yard, no matter how noisy or urban the area, as long as it has a privacy hedge! 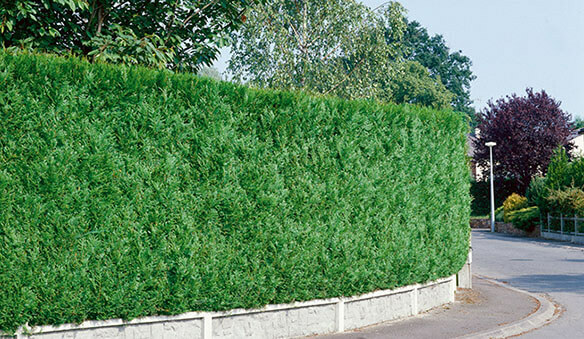 Best Evergreens for privacy block noise and peering eyes while providing beauty to the garden and a home for small animals. We have compiled a list of the best trees to use for privacy. They are each suitable for different situations, so we are sure you will find your perfect match! 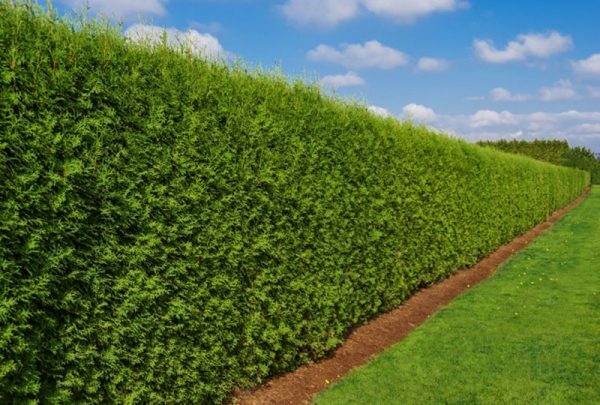 What Makes a Great Privacy Hedge? 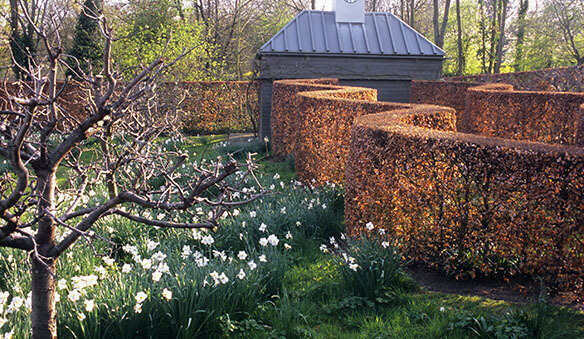 You want a tightly-branched hedge to avoid any gaps. You can do this two ways: opt for a hedge type with extremely dense branching, or trim your looser-growing hedge religiously each year. The great news about privacy trees over a privacy fence is you can usually grow a hedge much taller than you might be allowed to build a fence based on CC&Rs from your community. Want privacy for the second story windows of your house? No problem. This one is flexible. 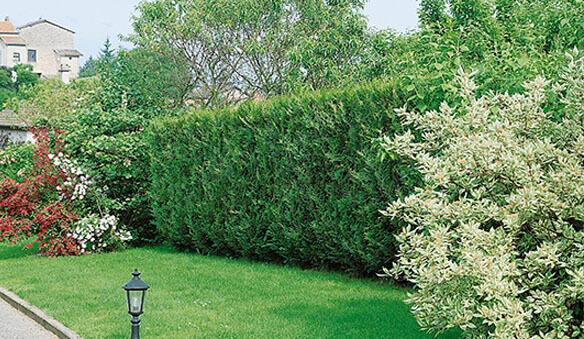 While evergreens will provide solid, year-round privacy, if you only need it for an outdoor space in the summer you could go with a deciduous hedge for privacy. 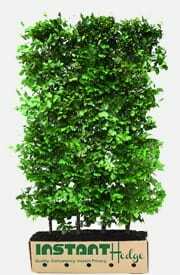 We recommend choosing something like European Beech, which is deciduous but holds its copper-colored leaves through the winter and still provides privacy. 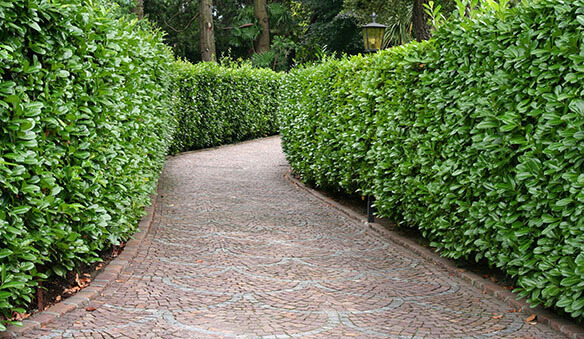 The key to maintaining a perfectly dense privacy hedge is consistent pruning on the sides. If the hedge is allowed to grow large and leggy, then pruned hard, you will end up with gaps (in laurels and beech this can be corrected, but in conifers, it usually can’t). 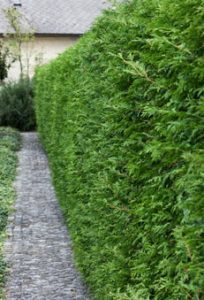 A quick, simple trim once per year on fast-growing varieties and once every 2 years on slow-growing varieties is all you need to keep your hedge full and dense. Pruning the top half of the hedge a little slimmer than the bottom will keep the lower branches nice and full (see the diagram below). 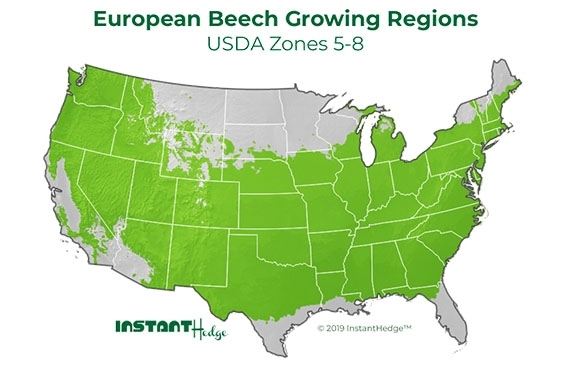 European Beech is an extremely popular choice in Europe and for European-styled gardens. 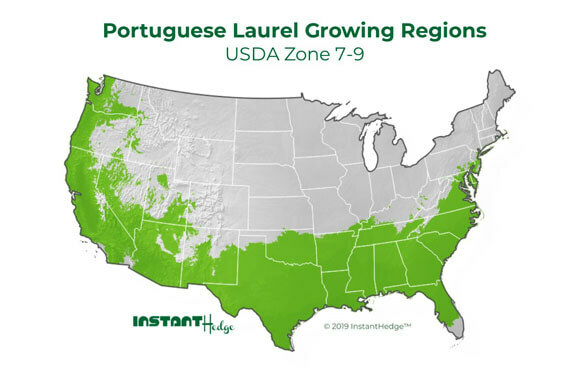 It offers lush, green foliage in the spring and summer and copper fall color that persists through the winter. Even though it is deciduous, the persistent leaves still provide some privacy through the winter months. Grows in full sun to part shade. One of the fastest-growing privacy hedges, English Laurel (or Cherry Laurel) will fill out a big space quickly. 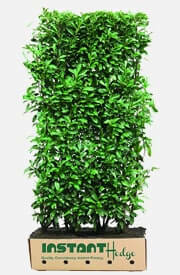 It is a great option if you want a tall hedge quickly. Make sure to keep on top of pruning to keep it from getting leggy. 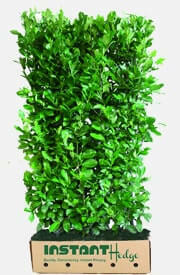 Beautiful glossy green foliage with white flowers in spring and inedible berries in the summer. Deer proof. Grows in full sun to partial shade. Schip laurel (sometimes called Skip Laurel or Schipka Laurel) has the benefits of the English Laurel with the added benefit of a more upright growth habit, requiring less pruning to keep the width in check. It also has a longer, narrower leaf shape that is a bit darker green. Grows in full sun to shade. 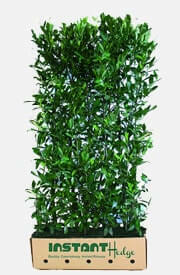 Portuguese Laurel has a wonderfully dense natural growth habit. It also grows quickly, so you could have a large, dense hedge with little effort in a very short time. It is a great option for warmer parts of the country as it is very tolerant of heat, drought, poor soil, salt, and pollution. It has stunning green leaves with contrasting red petioles. It has white flowers in the spring and bears black fruits in the summer that are inedible to humans but a good food source for birds. Deer proof. Full sun. American Arborvitae is a great choice for those in cold regions (it is hardy to zone 2!) who want a fast-growing privacy hedge. 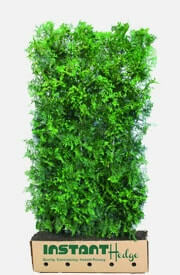 It will get tall quickly and form a very dense screen with consistent pruning. Grows in full sun to partial shade. 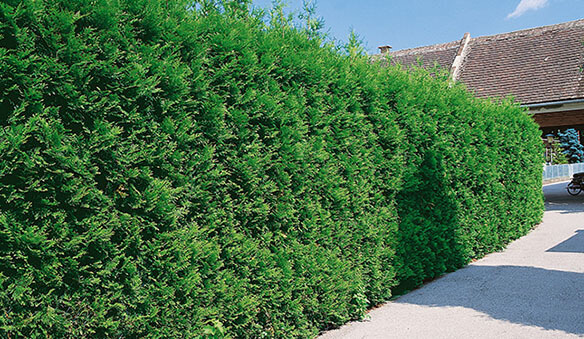 Emerald Green Arborvitae is the ultimate choice for a dense privacy hedge. With an Emerald Green hedge, there is zero chance of seeing anything through it. It grows slowly and requires very infrequent pruning. Although it grows slowly, it will become quite tall if given enough time. It has an extremely narrow footprint, so it does well in small areas. 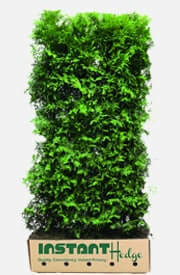 It has beautiful, dark green foliage. Requires full sun. Green Giant has an incredibly vigorous growth rate, reaching up to 5 feet of growth per year under ideal conditions! 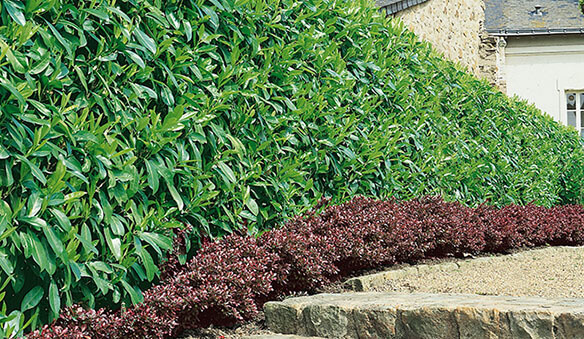 If a large hedge is needed as fast as possible, this is a great option. 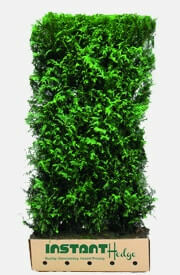 Green Giant has lush green foliage all year, providing optimum screening capabilities. 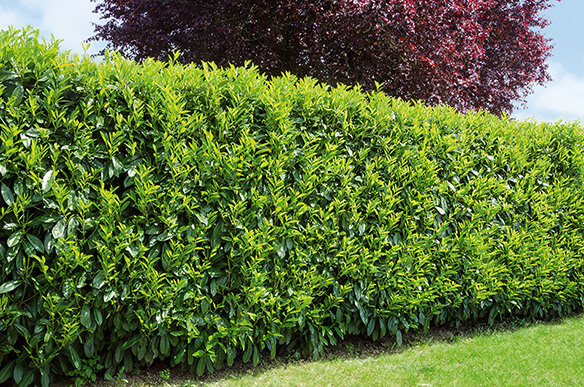 It will require intensive pruning to keep at a small size, but it is perfect for large privacy hedges. It does well in full sun to partial shade. Deer resistant. Virescens is a lovely, upright-growing cedar, native to the Pacific Northwest. Its unique habit means a small footprint, making it great for tight spaces. It responds well to either intense or relaxed pruning. It does well in full sun and partial shade.